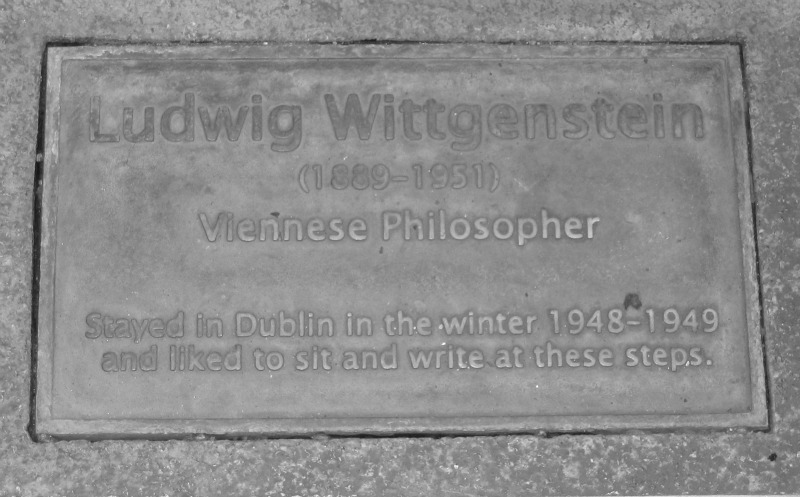 Ludwig Wittgenstein’s Dublin memorials. | Come Here To Me! Not too long ago, we had a brief post on the website here looking at the brilliant statue of Socrates (the philosopher, not the footballer) which stands proudly in the grounds of the Botanic Gardens. This raised the issue of another philosopher who is remembered in the Botanic Gardens, albeit for very different reasons. While Socrates never walked through Dublin city, Ludwig Wittgenstein did. Indeed, the Vienna-born philosopher, considered one of the greatest minds of his time, actually lived and worked in the city. 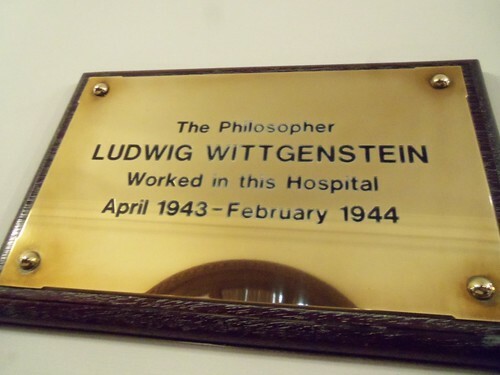 Wittgenstein had chosen Dublin because of his friendship with a consultant psychiatric at St. Patrick’s Hospital in James’ Street, Maurice O’Connor Drury. Before taking up medicine, Drury had been a philosophy student of Wittgenstein’s at Cambridge. But, in 1947, at the height of his fame, Wittgenstein had decided to resign his Cambridge Professorship and settle in Ireland. 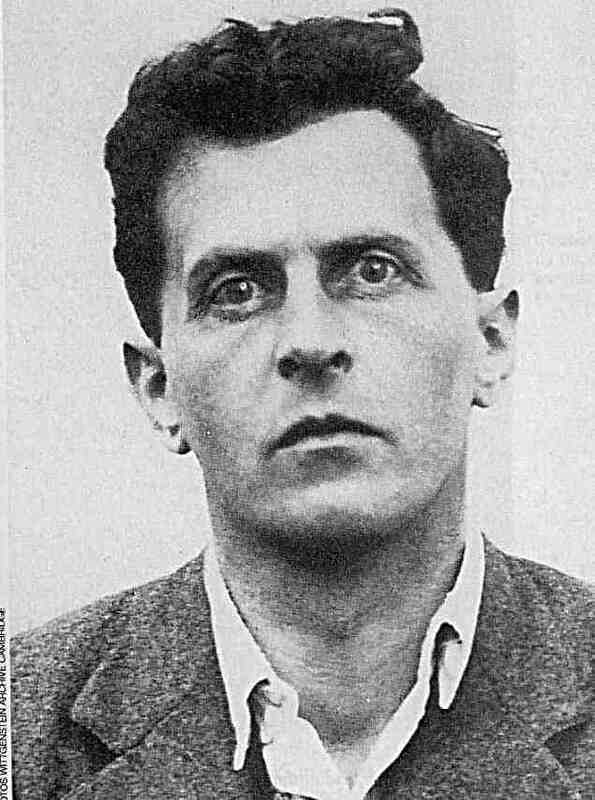 Wittgenstein spent two years of his life writing in Dublin, and indeed these were among the most productive years of his life, as it was during this time he wrote much of his most influential work, Philosophical Investigations. From November 1948 into the summer of 1949, he lived in a small modest room at Ross’s Hotel, today known to Dubliners as the Ashling Hotel. A small plaque on the front of this hotel marks the fact that Wittgenstein boarded here. This plaque was unveiled in 1988, by John Wilson, who was then Minister for Transport and Tourism. Richard Wall’s study Wittgenstein in Ireland provides good detail of his time here. His love for Bewley’s is evidently clear from his own correspondence. He would always enjoy the same lunch of an omelette and coffee, and was said to be delighted by the fact the staff there would always remember his order without even needing to place it. Wall notes that while we know for certain he frequently visited Bewley’s, the question of whether the great intellect ever stepped inside a Dublin pub remains unanswered. 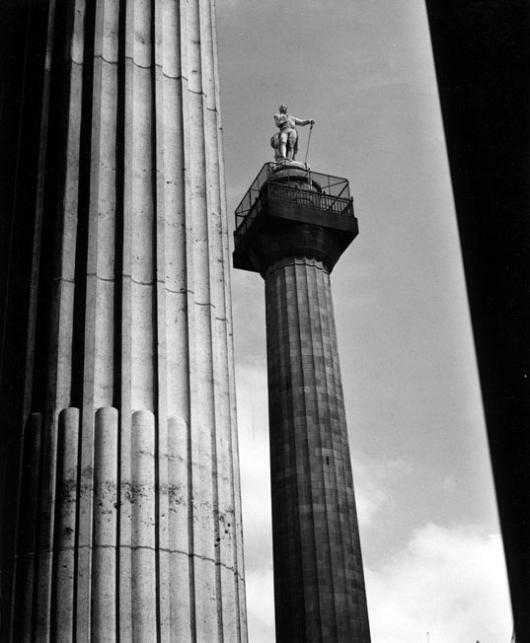 We know on one occasion that Wittgenstein and his friend Drury bought cheap cameras in Woolworth’s and then photographed the city from the top of Admiral Horatio Nelson’s Pillar! Nelson’s Pillar on O’Connell Street. Another plaque to Wittgenstein is found in the Botanic Gardens, a place he was said to find not alone relaxing but ideal for the purpose of writing. So close to the monument to Socrates, it’s interesting to think that one of the great philosophical thinkers of human history sat deep in thought. One thing is achieved by putting these notices in Irish. It makes one realise that one is in a foreign country. Dublin is not just another English provincial town, it has the air of a real capital city. So, what of the Dublin he knew? The Ross’s Hotel has since been replaced, the Pillar he climbed has been transformed into the Spire, Bewley’s on Grafton Street proudly remains despite its sister-branch on Westmoreland Street being transformed into a hideous Starbucks, and the Botanic Gardens have changed little. He based himself at Rosroe in Connemara on the edge of Europe believing that he could think all the more clearly in darkness (the district at the time having very basic electrification), it has been wittily suggested that the then rather grim and shabby Ross’s Hotel (Ashling Hotel today) provided Ludwig with not dissimilar comforts. Interesting man, with his roots and his life,pitty that he is knowing more as a british.austrian philosopher,good to know that he loved Dublin. Greatings from Vienna to all CHTM! Great post, about an extraordinary thinker. I had a tiny insight into this particular friendship mentioned above about a year or so back. I was leading a group of students on a tour in the old House of Lords on College Green, when i saw a man in his fifties/early 60s, and a woman in her early 30s listening. There were very nice and when we got chatting, it turned out that the man was the son of Maurice O’Connor Drury, and the woman was a philosophy post-grad (new Zealader but at Cambridge now I think) who was over visiting Dublin in order to study the voluminous correspondence between the 2 men. Amazing to meet the son of a man who was such great friends with one of the greatest minds of the 20th century. On a more trivial note, I also saw a carpet once, in a house in Oxford, that LW had chewed to bits. Apparently he hated callers-by and would get agitated! So the story went anyhow, (He’d certainly lived or stayed in the house for a while. (It belonged to one of the colleges, St Johns College I think) Anyway, thank you, for another great post, this blog is always great. Respects. -Arran. Nice posting. 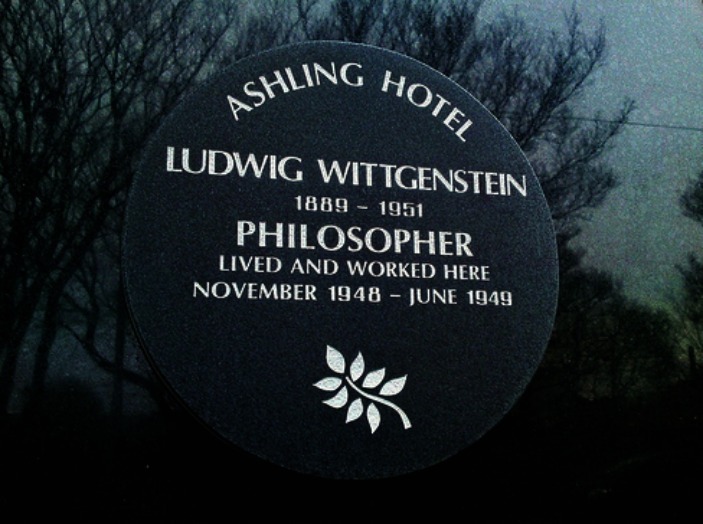 I had to do a double take when I walked past that plaque suggesting Wittgenstein worked in the Aisling hotel! There is another plaque to him at the site of the cottage he stayed in – now a hostel – near Killary harbour in Connemara, overlooking a quiet fishing inlet. Great location to write a book. Look, I hate to be the family pedant, but that last remark on death was not written in Ireland, but in a POW camp during WW1. His Philosophical Investigations also took him to Kilpatrick House, near Red Cross in Co. Wicklow. Thanks for the remark (Patrick) about philosophizing in the dark. Must try that. You can see why so many novels are based on him. It doesn’t claim he wrote that remark on death in Ireland? Okay fine. The implication was there, and for me that’s enough of a pretext. But surely the exciting part is philosophising in the dark? Turns out it doesn’t work. It is however not impossible that in Ireland he wrote that – remark number 194 – When we do philosophy, we are like savages … who hear the expressions of civilised men, put a false interpretation on it, and draw the queerest conclusions. His friend Drury wrote a memoir reporting comments about the smugness of priests, finishing with the incendiary phrase, Now the peasants inhabit the castle. Livid. Here is an extraordinary story I heard some weeks ago, from a very reliable informant, which many of you will be tempted not to believe. As noted in the very interesting contribution above, Ludwig Wittgenstein spent time in Connemara on a number of occasions, in the house of Maurice Drury, brother of a former student and later friend of his, Dr M O’Connor Drury, who became a consultant psychiatrist in Ireland. The place was called Rosroe, or Rosro, Cottage. Wittgenstein died in 1951 and probably last visited Connemara in 1948. At the end of the 1950s, the house became part of a project of renovation and extension to what was to become the An Óige Hostel in Leenane. My informant’s father was the building contractor who was responsible for developing the An Óige project and he told me that himself and his younger brother were sent into the cottage to ‘clear it out’ before building commenced. They climbed into the attic and found either five or six tea-chests, each stuffed full of detailed notes of W’s, stretching back over years. His father consulted the neighbour, whose name I will not reveal for charity, about what to do with it. It appears that the neighbour, and perhaps others, thought W was insane. The advice was to take all of the tea-chest materials down to the shore and burn them. I am reading this, speechless, with the feeling that, in contrast to Wittgenstein doing philosophy, when we do savagery we are like philosophers, reading the expressions of madmen, drawing entirely justifiable conclusions and consigning them to the flames. great story Piaras – ring of truth about it!!! Hi Oisín, it’s been a while since we published that article but I’ll try dig back for you and root it out. Thanks!